With one bold swing, Camilo Villegas turned a solid round at the Honda Classic into his lowest start in more than a year. 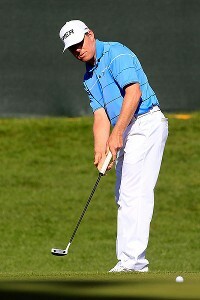 Luke Guthrie wrapped a PGA Tour card for next season, winning the Boise Open on Sunday for his first Web.com Tour title. Luke Guthrie rallied to win the WNB Golf Classic on Sunday for his second straight Web.com Tour title, holing a 12-foot par putt on the final hole for a 6-under 66 and a one-stroke victory. Robert Streb won the Mylan Classic on Sunday for his first Web.com Tour title, closing with a 7-under 64 for a four-stroke victory. From big bombers like Luke List to polished ex-amateur stars like Casey Wittenberg, ESPN.com's Farrell Evans takes a closer look at five Web.com Tour grads who could make a splash in the big leagues in 2013. Scott Gardiner of Australia had a 5-under 65 and wound up with the lead Saturday in the Web.com Tour Championship when Chesson Hadley stumbled at the end. Just 18 months ago, Nicolas Colsaerts had little reason to believe he could be going so many places. He was No. 179 in the world and had yet to win on a major tour. Kevin Streelman figured a good round Saturday would at least get him in the mix at the Tampa Bay Championship. Hudson Swafford, Nick O'Hern, Edward Loar and Ben Kohles shared the lead in the Chiquita Classic, shooting 5-under 67 on Thursday in the first round of the Web.com Tour Finals event.